Bimota Forum :: View topic - Newbie from Spain. 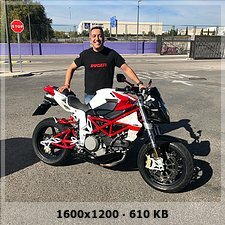 Posted: Wed Nov 28, 2018 6:17 pm Post subject: Newbie from Spain. A 2007 DB6 Delirio is finally in my garage. The bike has 25.000 km and some minor works to do. I rode it last Saturday to test, and my smile still continues. What a great bike!! Light, great on the brakes and very stable. Good advice will be appreciated! P.D. Do you now some way to make the clutch softer? 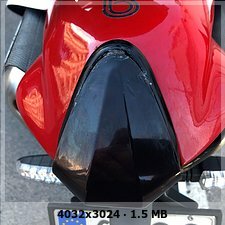 What rear fairing does it need? Yes, I mean easier to pull the lever! I will change the fluid, and see. Thanks for the advice, It's very interesting. As you can see the rear light is damaged, and I want to replace it. I have heard about Benelli Tornado Tre light, and I have bought one. But It didn't arrive yet. Did you buy a Benelli standard light or the LED version ?? If the LED, they are similar but mount slightly different so you need to do a little work to attach. I bought the standard one. I prefer to keep the bike "original". Will be easier to fit? I m also new with Bimota, DB6 1100 of 2007 bought in Spain with 4700km. I m in Porto, North of Portugl. Replaced the rear fairing light with one from Keeway 125 (LED). needed very small adjustment onbthe carbon fairing, and a new fixing. If you need, can sen pictures of that. Same year as my bike. I'm interested in the fairing light pictures! Any info about the bike will be appreciated. I will be very glad to meet you, I visited Porto with my KTM 1290 two years ago. Nice Montesa 348!! It was only for real men! Sure, but be careful with your feet starting the engine! Welcome to the club. I too have a DB6...but am a bit far away to meet as I am in the states. Re: the clutch, Ducati has used 22mm-25mm since 2001 or so. A larger slave cylinder piston helps the reduce the lever effort (insert bad jokes here...). I second 2bims' suggestion re: replacing the master cylinders with Accossato parts. Pure moto-jewelry. Why not a PR19 from Brembo ?